A creamy porcini mushroom sauce tossed through penne. 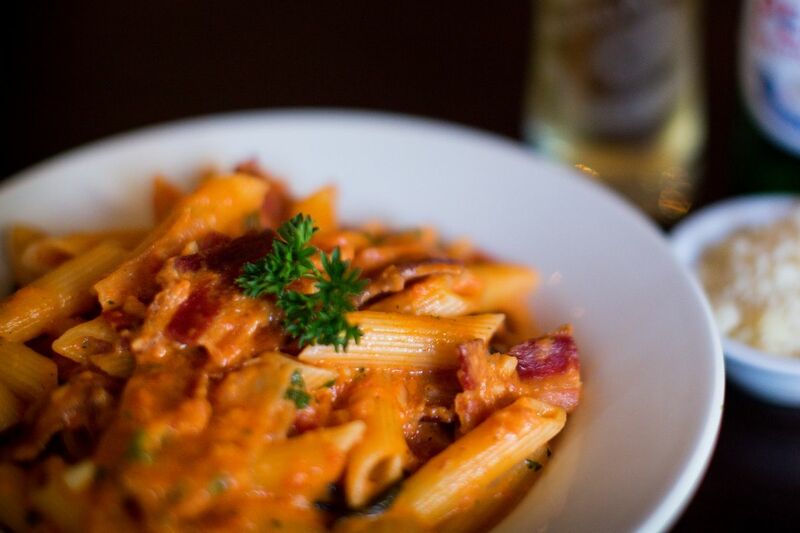 Diced pancetta (cured ham) flamed in vodka with cream, chilli, tomato, parmesan and fresh parsley tossed through penne. This well known rich sauce consists of pancetta (cured ham), egg, cream and fresh parsley served on spaghetti. Penne pasta tossed in fresh basil, spinach and toasted pinenuts with a dash of cream and fresh parmesan. The classic Tuscan tomato sauce tossed through farfalle. Mussels, shrimps, tomatoes, plenty of garlic, basil and parsely tossed through spaghetti. Made with tomatoes, capsicum, olives, mushrooms, chillies and capers served on penne. A creamy tuna and mushroom sauce served on farfalle. A subtle black olive, caper, tomato and anchovy sauce on spaghetti. Chopped garlic, extra virgin olive oil, pancetta (cured ham), Italian sausage and chilli tossed with spaghetti.